Renton, WA, Thursday, February 15, 2019, International Childhood Cancer Day (ICCD), which was founded in 2002 by Childhood Cancer International (CCI), is celebrated around the world each year on February 15th. CCI - a global network of 171 member organizations in 88 countries including Sweet Tea Cancer Connections, is committed to working with its international partners including the World Health Organization, SIOP, and others, towards the global goal of reducing childhood cancer mortality and the elimination of cancer-related pain171-memberring. On September 28, 2018 at the United Nations General Assembly, the World Health Organization (WHO) announced its new global initiative to address the disparity between childhood cancer survival in low-middle versus high-income countries. 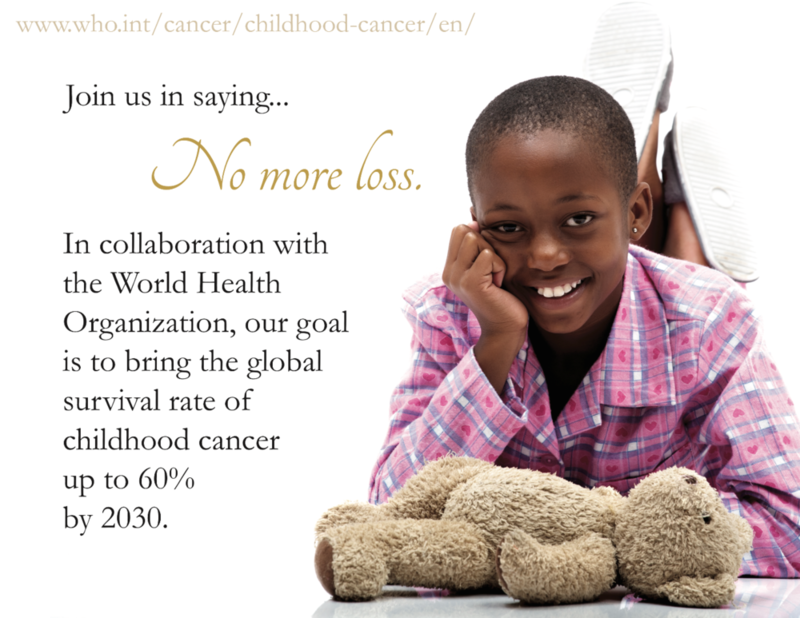 ﻿Each year, more than 300,000 children ages birth to 19 years are diagnosed with cancer around the world. Approximately 8 in 10 of these children live in low and middle-income countries where their survival rate is often near 20%. This is in stark contrast to high-income countries, where cure rates exceed 80% for many common childhood cancers. The target goal of the WHO Global Childhood Cancer Initiative is to eliminate all pain and suffering of children fighting cancer and achieve at least 60% survival for all children diagnosed with cancer around the world by 2030. This represents an approximate doubling of the current cure rate and will save an additional one million children’s lives over the next decade. On International Childhood Cancer Day, we stand united to make childhood cancer a national and global child health priority in support of the WHO Global Childhood Cancer Target Goals. ICCD 2019 campaign focuses on “No More Pain” and “No More Loss” for children with cancer and their families. To achieve this goal, governments, health care providers, industry, parent support groups and society at large must ensure the right to early and proper diagnosis; the right to access life-saving essential medicines; the right to appropriate and quality medical treatments, the right to treatment without pain and suffering and when a cure is not attainable, the right of the child to a pain-free death. Together, on ICCD, we raise our voices and envision the day when there is No More Pain and No More Loss for all children with cancer regardless of where they live in the world. Sweet Tea Cancer Connections, a Seattle based, 501c3, is diligently and passionately developing the world’s first, nonprofit, mobile app to connect parents who have children with pediatric cancer. The Community Heals app is a first of its kind technology that will foster meaningful connections, which hospitals legally cannot do. Our commitment is geared toward treating the psychosocial components of the long and difficult pediatric cancer journey. By focusing on the emotional turmoil, loneliness, pain, and stress, families can enhance their resilience, hope and quality of life—it’s as important as treating the disease itself. Parents will know that they are not alone, and together they are stronger. Please sign up on our website for more information about our mobile launch later this year https://sweetteaconnections.org/contact-us and watch our video. Renton, WA, Thursday, October 27, 2018 -- Sweet Tea Cancer Connections, a Seattle nonprofit developing the world's only app to connect parents of children with cancer, held its first fundraiser Saturday, October 20th at the Fairwood Golf and Country Club in Renton, WA. 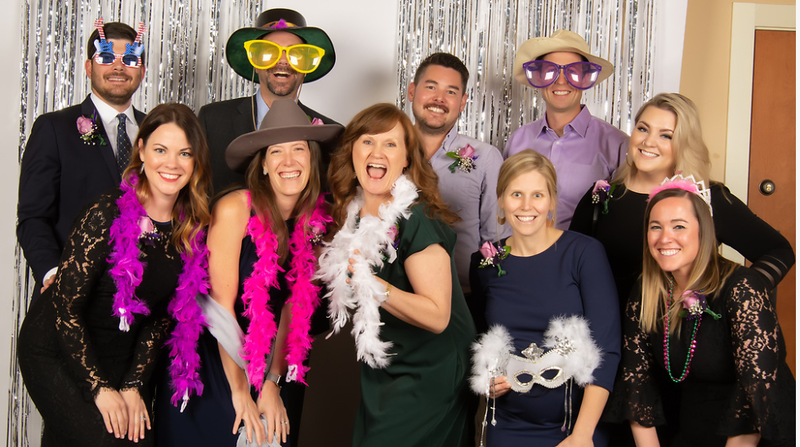 The Community of Hope Gala raised nearly $135,000, far exceeding its goal of $50,000 and putting it well on its way to obtaining the $200,000 needed to complete development of its healthcare mobile app. Sweet Tea Cancer Connections (STCC) was founded by Tatum Fettig following the diagnosis of her daughter, Teagan, with brain cancer. She says, “The difficulty of being able to find parent support after my daughter’s brain tumor diagnosis, provoked me to create a mobile app.” Because physicians and nurses are bound by confidentiality and HIPAA limitations, families impacted by pediatric cancer often fight their journey in isolation. Sweet Tea is creating the app, called Community Heals, to foster connections, increase hope, and instill resiliency among parents. While STCC has had great success in attracting volunteers, the Gala was its first major effort to turn that support into the dollars needed to pay for the software development team that will provide the coding for the app. Tatum's dad, Tom Slining, said "There was something very magical in the air that night. Truly a night to remember for the rest of our lives." STCC's Vice President, Sooze Johnson echoed those thoughts, "Over 170 passionate and generous people showed up . . . and we were certainly blessed with their open hearts." Research supports the need of a parent connection app such as Community Heals since community heals. The Community Heals app is a first of its kind technology that will foster meaningful connections, which hospitals legally cannot do, to provide hope, knowledge, information, support, and empowerment through relationships with families on similar paths to help increase resiliency. Parents will know that they are not alone, and together they are stronger. For more information visit www.sweetteaconnections.org or watch our video here. Two special kids were honored as Chief for a Day by the Covington Police Department and the King County Sheriff’s Department. On August 26, 2016 Teagan and JK had the honor of being Chiefs for the Day for the King County Sheriff’s Office and the Covington Police Department. We got to attend this heart warming event where she and 34 other little chiefs diagnosed with chronic or life threatening diseases were honored. They got to be chauffeured from the ShoWare Center to the training center via motorcade and were showered with an incredible amount of love both during, before the event, and following. Events like these not only bring love and energy to families impacted by life threatening and/or chronic medical conditions but also connect families on similar journeys and let us know we are not alone in this journey. We could not be more grateful for the King County Sheriff’s Office’s support, love, and kindness towards our family.